Residence: 1900 Blaine City, Whatcom, Washington . In 1910 at Point Roberts, Whatcom, Washington . Daughter of Dagbjort 'Dagbjartsdottir' Þorsteinsson and Helgi Þorsteinsson. On May 19th, Roy had information from Pauline DeHaan, many cousins and family, all come together painting a picture of Roy's grandmother, Guðrún Runa nee 'Thorsteinsson/Stoneson' Christopherson and her best friend Runa 'Thorsteinson' Thordarson. In America we usually spell Guðrún as Gudrun. For without Pauline and their help, this tale might not of been told! Imagine your great grandparents taking a train after leaving, their homeland of Iceland, forming a friendship with another couple, that lasts their whole lifetime, and more importantly continues with their children; Guðrún & Runa. Here is an example of just that, Lifetime Friends. Update: According to Pauline, Runa herself made this booklet about 1980. 'Echoes of the Past' was posted online, which of course, Roy found after Pauline at the Point Roberts Historical Society brought it to his attention. In the book, Runa recites her mother Dagbjort's diary, she was known as Daga. Daga and childhood friend, Helgi, whom she married crossed the Atlantic from Iceland to Victoria B.C.. Then Runa, Daga's daughter, continues the history of the family based on personal letters. Wow, Roy thinks! Our family has many photo postcards 'photographed' by Runa herself. Probably sent to her close friend, Roy's Grandmother, Guðrún and Kjartan Christopherson, and passed down to her son, Sig, then his brother Henry, then scanned by Roy and shared on the Internet. Pauline was kind enough to confirm this, and send a recent newsletter with Runa and her family. 'Echoes of the Past' talks about all the places Stone Stoneson family and their daughter, Guðrún lived...including Crescent (See Ytranes Homestead under Maps), which is probably when Kjartan met Gudrun. It solves the G&B mystery photo! Here is a passage on page 9 & 10 describing how Runa's parents meet Thorstein and Ingebjorg Thorsteinsson. "They met on train, enroute to America, then separated to be neighbors years later." Passages of his name change to Stone Stoneson, and details confirming it is our family. This would solve the riddle. How did Runa become one of Gudrun's best friends? Why would grandmother Guðrún 'Rooney/Roonie' nee Stoneson Christopherson have so many photos of a Runa (Gudrun), which was again answered by Pauline. Runa was a photographer. Roy has one photograph he retouched of the two Runa's together shown above. While separated by water, Blaine, Washington was not far from PT. Roberts were Runa grew up." Roy's latest find state Stone had 40 acres at PT. Roberts on the west side. The pages in 'Echoes of the Past' go on with incredible visions of the hardships of not only surviving blinding fog on a ship with the late evening silence broken every few minutes by a horn, to avoid colliding with other boats, along with one woman disappearing in Scotland from their party, it details their homestead and daily life in PT. Roberts! We now enter about 1904 when Helgi's son is born. The part of the story about the ram is as good as when Veiga, daughter of Sigurdur, placed her baby on the ground to help put out a fire, coming back to find the baby safe. Back to 1904 or after, Stone had lived on PT. Roberts and sold his cows...Ah Ah Ah, you'll have to read the story for yourself once Roy contacts the family. Reformatting the story with Runa's photos is now dancing in Roy's imagination. Maybe a historical task for the family Publishing Team. for the family only here. On April 14, 2013, Roy emailed Gary Simundson photo #3404 and the back with names on it. Two names stuck out, as every person was not recognized in the many photos in the collections. The names Helgi and Margaret. Knowing Gary´s family connection [see below], Roy sent a copy to him. Here is a family photo verified by Richard "Rick" Castellano, 4th son of Hilda Thordarson. "Runa Thordarson as she is my grandmother. Her daughter Hilda Thordarson was my mother." Great shot of the family! Runa was a prolific photographer, and we hold many of her original photos. She also made her own postcards from photos. "Our chlidren and all eleven grand children. Home together for the first time this summer "
Charlotte Thordarson, holding Dorothy . There are no names on the photo. The following is from family or based on comparision of multiple photos. 4. *The woman next to your grandmother is Vala Christopherson, my grandmother, and she is holding my mother [Baby Evelyn Sigurveig Christopherson Ruccius]. I think that is the first photo of her. Who is your grandmother holding. Who was born in 1919 or 1920? 6 . Vala´sister Gudbjorg, known as Bertha THORDARSON Campbell - Miriam's email. Miriam has a copy of this photo and was given to her by her mother. 7. Possibly Dagbjort Thortesinson or Ida Pearl Badger. 16, *Herman Alvin "Uncle AL" Chistopherson is sitting on the ground in front of Lilja Costello. Roy makes another discovery this evening. For a year he wonders who Groa and Kolbeinn were, and why there are photos of them, not just a few, but many photos. There were postcards and photos of their entire life, probably sent to Gudrun! It is hard for us in this day and age, to understand the past. With the Internet connecting us in less than a minute, to any point in the world, to find something like this book posted in PT. Roberts, or even Sagas in Iceland. We cannot imagine mail arriving by boat once a week. Photographs were new in the late 1800s and became less expensive to send to relatives or friends. When was the last time you sent relatives photos of the family? Groa was the 2nd born of Helgi Þorsteinsson and Dagbjort 'Dagbjartsdottir' Þorsteinsson, known as Daga. Groa married Kolbeinn Simundson, who became Reverend. There are many unknown family or friends in the collection of photo scans by Roy, the mystery of who Groa and Kolbeinn, for this family historian has been solved. The mystery photo of the Baby in the Buggy may have an answer after all, since Roy has a few more pages of 'Echoes of the Past' to read. See image 3379 below. Runa's family are Icelanders, thus, at some point, our relatives. Roy had to create this page! "Crystal Water Beach was part of the homestead of a family named Taylor from the eastern United States. Mr. Taylor, of English descent, established a home and orchard near the present junction of Robert Drive and Waters Road." Is this our William Taylor? Reviewing timelines, our Taylor was at Argyle District, Manitoba, Canada, NW 36-5-14 Taylors Hill in 1881 and passes away. Found Daga's actual gravestone...I think. Like playing darts, Roy just keeps throwing them (searches on the Internet) until he hits the board or get a bullseye. The birthdate seems to match. Now before I got to this page with many Thorsteinsons. Yeah, internet searching gets over-whelming. Without photos of them, this is the next best thing. Just wondering if related having same name. A common name. As stated on Runa's story, Stone Stoneson met her parents on the train. Thorsteinson is almost as common as Smith. Another clarification...there is a photo thought to be Nancy Piper. The caption says that it may be Groa's daughter. Nancy is Groa's niece, the daughter of her youngest sister Elsa Piper. 5. Elsa (the children of Helgi and Daga). You have Runa's three children. And now Groa's six. Laugi's children are twins Robert (deceased) and Sylvia Schonberg. Jonas's daughter is Living X.
Elsa's daughter is Nancy Piper. Whoa, If the child is correct which I do not recall seeing before, this may be the connection to The Pipers! I have a bunch of postcards from The Pipers of this little girl to a young woman. The Christmas cards are very elaborate for the time. Wow! Look, there is an Elsa listed as possibly the mother. Leads to here. Helgi, Runa´s son is on left with ball. I visited your webpage and it is very interesting. You have done a lot of good research. Dagbjort's diary has been made into a small booklet by her daughter (now deceased) Runa, (the photographer) and is in the Point Roberts library called "Echoes Of The Past". Runa wrote it in the 1980's, I believe. Pauline is in contact with Runa's nieces and Paul and Dorothea in Point Roberts, WA. Roy ends this Tale of Runa, Gudrun and The Pipers with photos of one child. Possibly the baby above, Nancy. Atleast until he receives a group photo of the family . Runa's story and this tale were so compelling he wrote this out throughout one evening into the following day. long shot down the top of the dyke. past corners of walls. Pointed end-2 angle cuts. We have this picture in the archives.I assume it a log cabin that was already here when the Icelandic settlers arrived. Roy believes this to be at the PT. Roberts Cannery. "Ben and Runa owned Ben's Store, the one and only store on Point Roberts to be open all year long. Runa used postcards such as this for their Christmas greetings to friends and customers. The store was one of those good old fashioned "we have everything" type of stores. One resident remembers being able to do all her Christmas shopping right there with fancy boxes of chocolate, perfumes and all sorts of stuff. If you couldn't find it at Ben's, you had to travel to Bellingham an hour plus each way in those days, or into Canada to Ladner, B.C. or up to Vancouver B.C. She (Runa) did a lot of photography and we have her to thank for a lot of historical images of Point Roberts in earlier years. She probably is the photographer that did most of your postcards as she would write "Point Roberts" on the postcard and had them printed on card stock. Research Groa, she married Kolbein Simundsson who became a Lutheran Minister in Seattle, perhaps in the Ballard area. I should mention that their youngest son, Dan Simundson, became Dean of the Lutheran Theological College in Minnesota." Blaine Icelanders have a website you could contact for information. The contact person is Rob Olason. Roy found Sylvia Schonberg first quite awhile ago. She is the grand daughter of Helgi and Daga, daughter of Laugi, and still resides at PT. Roberts. We have never been in contact. Sylvia Schonberg is a Point Roberts native whose grandparents, Helgi and Dagbjort Thorsteinson, were among the founding members of Trinity’s congregation. She began playing the organ at Trinity at thirteen years of age and has being playing since then at churches wherever she has been. After graduating with a Bachelor of Science Degree at Washington State University , she raised a family of six children before beginning her teaching career. Later she received a Master’s Degree in School Counseling from Western Washington . Sylvia returned to Point Roberts in 1987 and has been since then Trinity’s organist and pianist and member of the Worship and Music Committee. 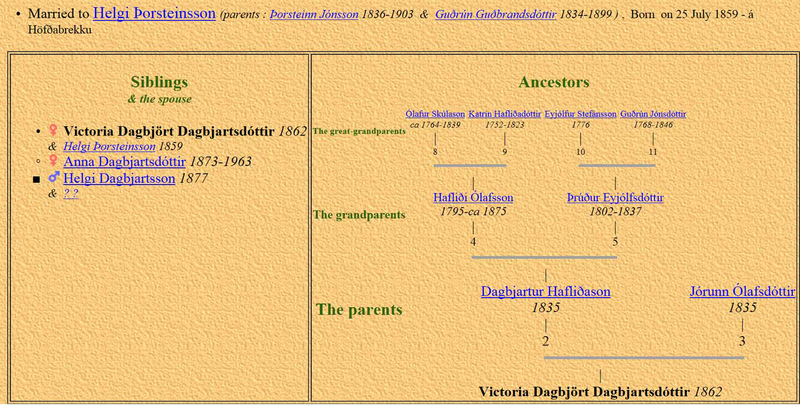 Here is Helgi´s lineage back in time. Courtesy of the great Helgi Helgason, who Roy is greatly appreciative of his work in genealogy in Iceland. In 2004, it was ranked first before Anna and Sigríður. According to Icelandic custom, people are generally referred to by first and middle names and patronyms are used if disambiguation is required. In Old Norse, Goðrún was an alternative version. The Faroese equivalent is Guðrun and the mainland Scandinavian version is Gudrun. Meaning & History From the Old Norse name Guðrún meaning "god's secret lore", derived from the elements guð "god" and rún "secret lore". In Norse legend Gudrun was the wife of Sigurd. After his death she married Atli, but when he murdered her brothers, she killed her sons by him, fed him their hearts, and then slew him. Many girls in Iceland are named Runa, and many of them are called Runa if their first names are actually Guðrún. Disclaimer: Roy retouched the Intro photo of Guðrún & Runa. He believed if Runa had the same tools, she would do the same. Only possible due to having other photos of both of them, which were almost exact in pose, age and features, which Roy used Photoshop Dodge & Burn tools. This Tale has not been approved by Runa's family. Any corrections are welcomed. [1, 2, 3, 4] Ancestry.com, Public Member Trees (Provo, UT, USA, Ancestry.com Operations, Inc., 2006), www.ancestry.com, Database online. Record for Runa Thorsteinson.